Travel with Kevin and Ruth! : Happy Birthday Sadie! How is it that the days can drag by sometimes, yet the years seem to fly? Taken at Sadie's birthday party on the weekend. Our daughter Lindsey made the cake! We get to see them all again in another six weeks! Buy yourself a $100 gift card on Amazon.com, and get a $5 gift card for free! Yep, the time sure gets by us all! Cameron is now in 5 year old kindergarten. It is amazing how they grow up so fast, Happy Birthday Sadie ! They seem to grow up too fast these days! And, thanks for Sadie's birthday wishes. Happy birthday to Sadie! What a great cake! What a doll. I love the cake. Thank you for Sadie's birthday wishes Rita! Grandkids are the best! They do grow up way too fast! 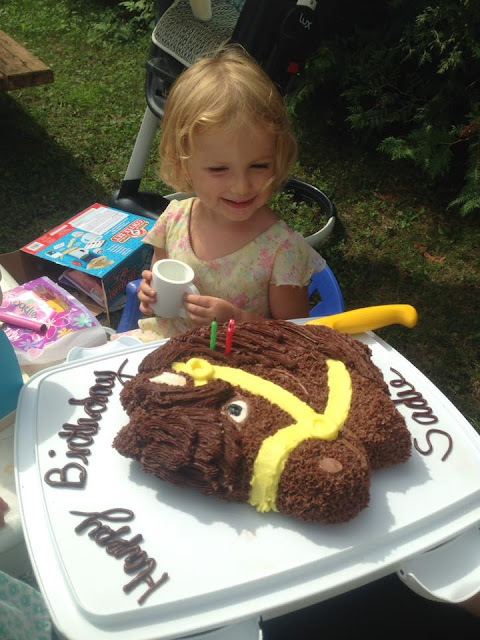 Enjoy your time with them ♥ Your little Sadie is darling and so is her cake! It's times like this that are make it hard being so far away from the family. Nice to have phones, and internet though to bring us all a little closer.